The Lilac flower has always been a sweet reminder of a well sprung spring in times past. The fragrance filled the dinning room where a freshly picked bouquet beautified the dinner table. As a child in the country, this was just one of the many fond memories called to mind, especially when that smell would once again hit my nostrils. After reading about lilac wine in a foraging book I knew right then and there that this was a project worth the effort! Per one gallon of wine desired a gallons worth of flowers is needed. When out on a drive it isn’t long before one is caught by the seductive aroma of these blossoms. And because it seems that everyone besides myself has a lilac bush in bloom, I find myself asking a neighbor for the needed harvest. Only 15 minutes later… and I’m able to fill a grocery sack! Yet the real work came later when removing the flowers from their green stems, easily taking an hour. 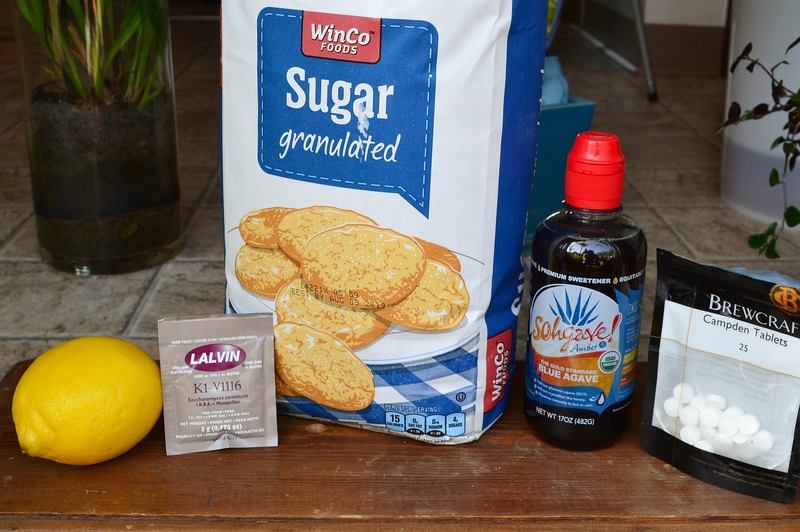 This recipe is based on the following website >>RECIPE<< with a slight modification of my own – replacing one cup of sugar with Blue Agave Nectar, reducing the amount of sulfites used and not using any yeast nutrient. No profound difference, just a preference. 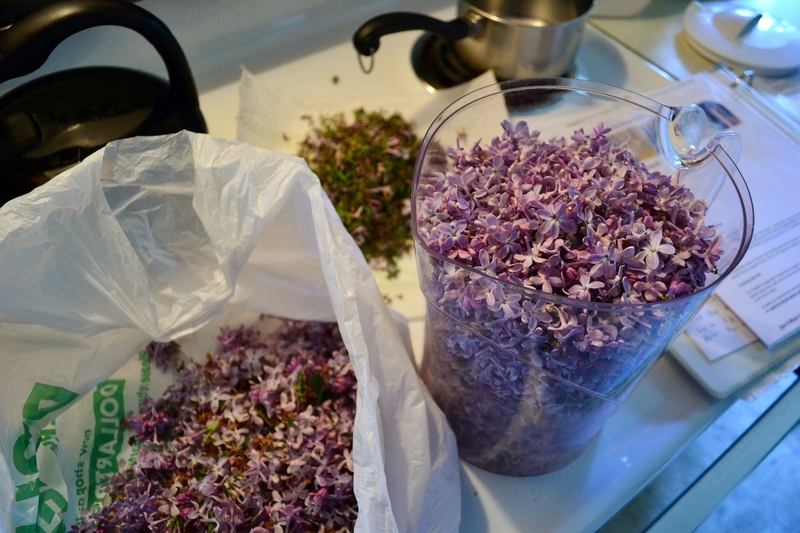 To start by making the lilac tea, one needs to separate enough blossoms from their green stems to fill a gallon size container (note first image above) Next, a gallon of (good tasting: spring/filtered) water is brought to a boil. With the plucked blossoms in a sterilized* 5gl food-grade bucket, the boiling hot water is poured over them. A lid is placed tightly on and this “tea” is allowed to steep for 48 hours. There a two methods for straining the spent flower pedals. 1) you can pour your tea through a colander into another sterilized bucket… or my preference 2) placing a clean nylon netting sack (like the kind for putting dirty laundry in but only unused) as a liner in the bucket before dropping the blossoms in and pouring the boiling water. When the tea is done you simply remove the net, catching all the flowers and squeezing the excess liquid into the bucket. With the pedals removed you can now add the sugar, nectar and lemon juice, stirring with a clean spoon till fully dissolved. Once dissolved, a small sample is removed and poured into a hydrometer – testing the specific gravity. Mine read 1.092 or a potential alcohol of 12%. The use of a hydrometer is completely optional, but it does help you know the alcohol content as well as the activity of the fermentation. Now the yeast is pitched, sprinkling it from its package over the surface of the “sweetened tea”. The bucket lid is placed back on and the date as well type of wine is written on top as a record. Place the primary (your bucket) in a dark, mild temperature room or closet and allow to ferment between 7-10 days. At this point the active fermentation should have calmed down quite a bit. (Again I measure the specific gravity for my records and write it down in my notebook – 1.062.) Using a sterilized rubber tube the wine is siphoned from the bucket into a sterilized 1gl glass jug, carefully avoiding the sediment at the bottom. 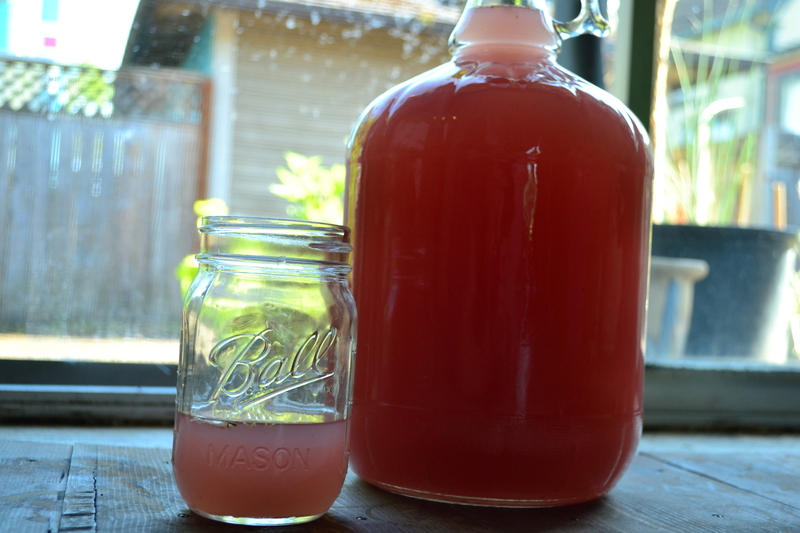 Once the jar is full, a sterilized airlock corks the jug and is properly filled with water. This allows the gasses out yet keeps air and unwanted microbes from coming in. Again place your secondary in a dark room and forget about it for one month. The secondary freshly filled with airlock on. The slow fermentation will take place over the months to come (4 – 8 months) About every month you want to use a sterilized tube and siphon it into another sterilized glass jug – again avoiding the sediment on the bottom and corking it with an airlock. Every time you do this your wine will get clearer and clearer. After racking it a few more times over the months your wine will reach a nice clarity at which point the fermentation should have reached a near halt. Before the day of bottling, once again measure the specific gravity or “final gravity” for final alcohol percentage, crush up the Campden tablet and sprinkle it into the wine and wait at least 24hrs (this will kill any remaining yeast and help prevent oxidation). The day of bottling have all your sterilized bottles ready to be filled. One gallon of wine fills approximately 5 – 750ml wine bottles or 10 – 12oz beer bottles. Using the siphon technique fill all your bottles, capping or corking appropriately. Store your bottles on their side in a cool dark room. Waiting is the hardest part, however your wine will be ready in one more month and will reach its peak flavor in 6 months. Plum wine on the left with lilac wine on the right. It will be a couple more months of fermentation and many more racking’s before bottling, yet I appreciatively await the finished product. Help fund The Northwest Forager by purchasing quality handmade furniture from Hanks Rustic Shop. Click the picture to follow the Etsy link. ‘Sterilization’ as over emphasized in this article is very important in the reduction of yeast or bacterial contamination. Although the production of alcohol kills any harmful known pathogen, the finished flavor can be seriously offset by any such contamination. There are a few methods of sterilization, each with their said “pros and cons” however I prefer to use the good ol’ bleach and water method. My method is simple, use about 1 tbsp of bleach per gallon of cold water. Soak and scrub your pre-washed equipment in the bleach solution. Then rinse well with very hot water, not scalding (don’t burn yourself). Place equipment on a clean towel and let air dry. Thanks for sharing! I was wondering how to use all the amazing lilacs everywhere. Wow, I had no idea this was even possible. Could you do it with Lavender I wonder? I hadn’t thought of lilac wine, have for jelly, may have to make this one day. 🙂 Thanks Hank. I have the primary going now. 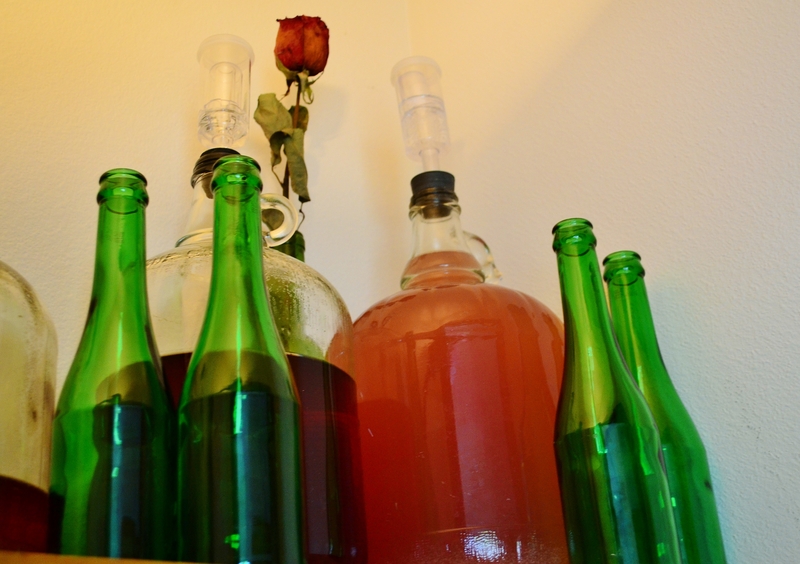 Picked last Saturday, strained spent flowers from the tea and pitch the yeast on Monday. There’s a nice ferment going. Hi Craig! Please keep us updated.